Everyone who has said this team overachieved last year might just regret their prediction. Three games in, and Toronto is still perfect. Toronto is no stranger to fast starts – they’ve been doing it for quite some time now. For some reason, this team just bursts out of the gate. Now the question is whether or not they can sustain the effort through the whole year. The ’11-’12 season started with Phil Kessel and the Toronto Maple Leafs atop the NHL standings. But a brutal finish to the year dropped the Leafs out of playoff contention and land top pick Morgan Rielly. The lockout-shortened season last year showcased a similar dilemma. If it were not for the heroics of James Reimer at the end of last year, the Leafs would have easily lost their playoff spot. So it remains to be seen if Toronto will find the consistency that has eluded them as seasons prior dragged on. However, no one can complain about 3-0-0 to start the season. There was a lot of talk about how the Leafs were making a big mistake in acquiring Jonathan Bernier. With Reimer already a proven tender, many felt that the cost of acquiring Bernier was too steep. But if these first two appearances are any indication, this was a tremendous steal for the Leafs. Bernier has played with poise and has given his team a chance to win both teams he has been between the pipes. Saturday’s game was a perfect example – after Reimer had a bad showing after allowing 4 goals, Bernier stepped in and stopped all 15 shots thrown at him as his team tied the game. To put the cherry on top of the cake, Bernier stopped all attempts in the shootout. This could be the start to a long and success career in the blue and white. The speedy winger came into this season with many holding low expectations for him. So far, he has blown those perceptions out of the water. Playing primarily on the third line with Troy Bodie and Dave Bolland, Raymond has put up 2 goals and 2 assists in 3 games so far for the Leafs. He has looked good on the PP alongside Nazem Kadri . It is slightly surprising that Raymond was not given a chance to play alongside Kadri and Joffrey Lupul following the injury to Nik Kulemin. However, the season is still young, and given Raymond’s chemistry with Bolland, it does not seem matter where Raymond is played. He continues to develop good chemistry with everyone he plays with. Raymond could easily provide the most bang-for-buck out of any FA signings this off-season. The Leafs led the league in fighting majors last year, and that does not appear like it will change at all this season. This isn’t including enforcer Frazer McLaren, who is currently out with a broken finger, or the gritty David Clarkson, who is currently suspended for 7 more games due to leaving the bench during a preseason game. Whether you love or hate fighting, or if you think it has or doesn’t have a place in hockey, one thing is clear. 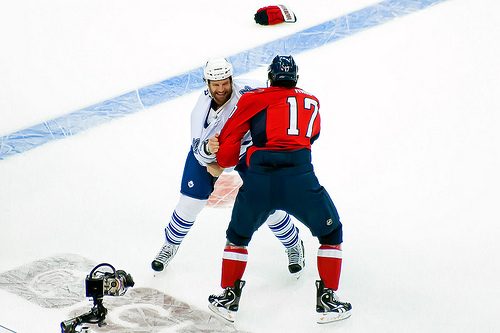 The Leafs will be dropping the gloves. And they will be dropping them very often. This team could easily lead the league in fighting majors again this year. Before the season had even began, the Maple Leafs were already dealing with injuries. Joffrey Lupul had back spasms, and Colton Orr sat out as well, but both are now back in the lineup. Frazer McLaren, as mentioned above, is still injured after a Carter Ashton slash during training camp. Unfortunately, the injury bug has continued into the regular season. Joining McLaren in the box is Nikolai Kulemin and Mark Fraser. Kulemin has a bone chip in his ankle, which makes it nearly impossible for the winger to skate without excruciating pain. He is expected to be out for at least 2 weeks. Spencer Abbott was recalled to replace Kulemin on the Lupul-Kadri line. Fraser suffered a knee injury in Wednesday’s tilt with the Flyers. The stay-at-home defenceman is expected to miss 3-4 weeks. Rookie Morgan Rielly will draw into the lineup in his place. On top of all that, David Clarkson is, of course, still out of the lineup. Even GM Dave Nonis is “injured”. With 4 roster players out of the lineup so far, it’s honestly a miracle that this team is still undefeated this season. The NHL regular season schedule was released on Friday. Check out our partners at TiqIQ for the best deals on Toronto Maple Leafs tickets for all 2013-14 games.